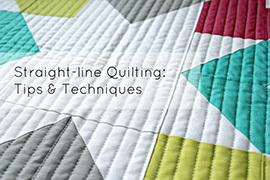 well folks, i'm back from quilt market and officially rested up (i think!). talk about five fun filled days! if you ever get the chance to travel to Kansas City, i highly recommend it. the weather was perfect, the people were friendly, the food was great, and the Power and Light District rocks -- seriously! 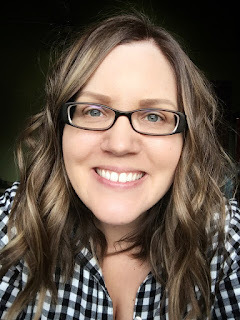 now that i've had a few days to get back into the swing of things, i can't wait to share what's been going on lately! 241 Tote Pattern from Noodlehead. 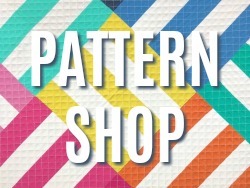 first things first, i need to choose two winners for the 241 Tote Pattern giveaway. the winners are: #6 Katie B. and #45 Jodi-usairdoll -- congrats, ladies! 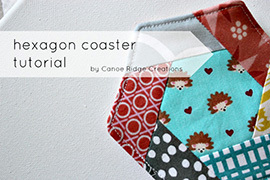 thanks again to Anna from Noodlehead for sponsoring this great pattern giveaway! 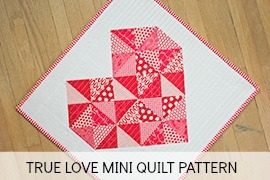 i just need to sew a few more linen hexagons onto this HST+hexagon mini quilt. 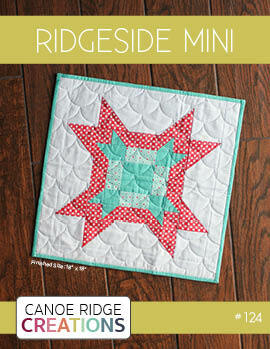 i've really enjoyed the process of hand-piecing this little mini -- even if it is slow and time consuming! 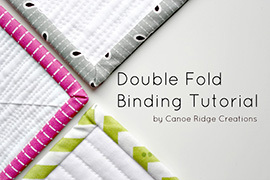 call me crazy, but i'm thinking i might tackle a Spring Carnival paper pieced project next. Katy just makes them look so stinking fabulous! scraps, scraps, scraps! my scrap tub has been bursting at the seams for a while now so this morning i decided to tackle the issue. rainbow scraps + mason jars = yummy. the only problem is this didn't even make a dent in the scrap stash, yikes! thanks to Michelle for the great scrap organization idea! 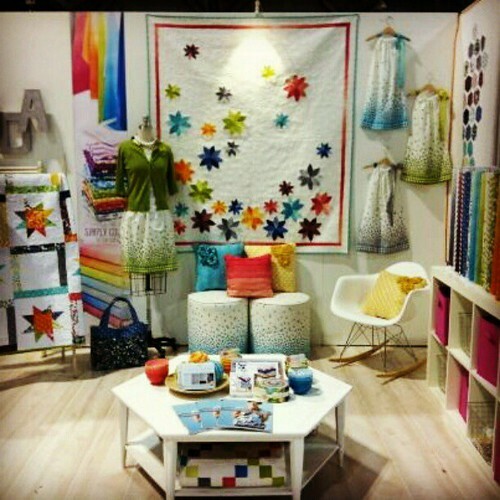 and finally, here are some more pictures from Quilt Market! Erin and I were finally reunited. 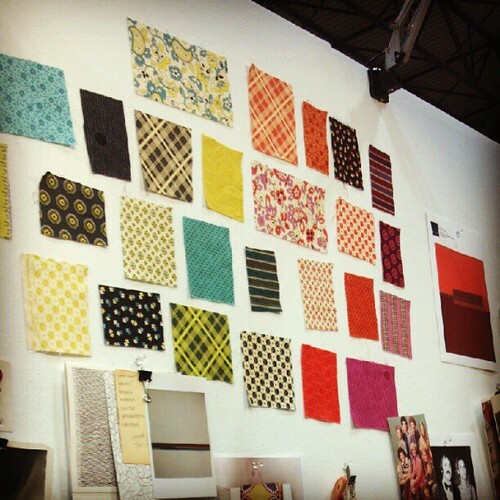 Vanessa's awesome booth with Moda Fabrics. Ever Kelly with Andover Fabrics. 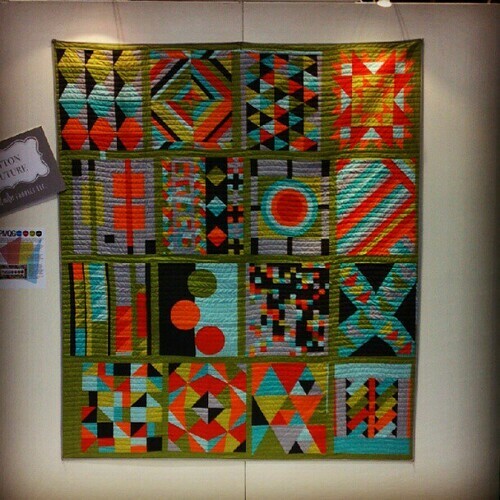 PMQG solids quilt in the Michael Miller booth. those sunglasses are hilarious! love it! I love those scrap jars! Super cute. 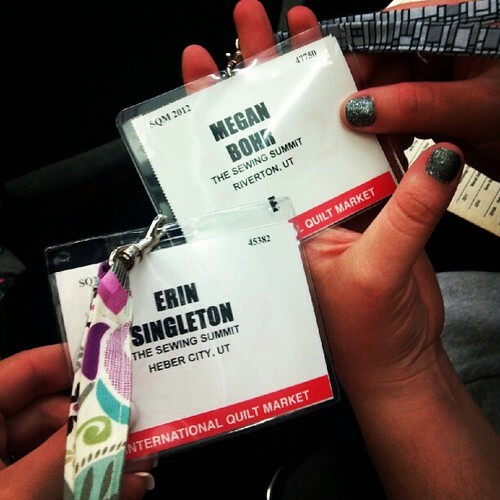 thanks megan, and looks like market was a blast! so sad I couldn't come. :( Vanessa's booth looks amazing!!! 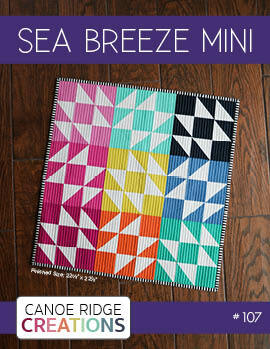 and your mini hex is going to be so so pretty! I need deer in specs!!!! Woo hoo! 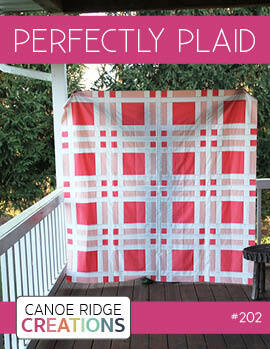 I'm pumped about the pattern. I really need a new bag! Love your hexagon progress. Love the scrap/mason jar idea...like you it would not make a dent in my scrap collection...but it would look pretty on display!! 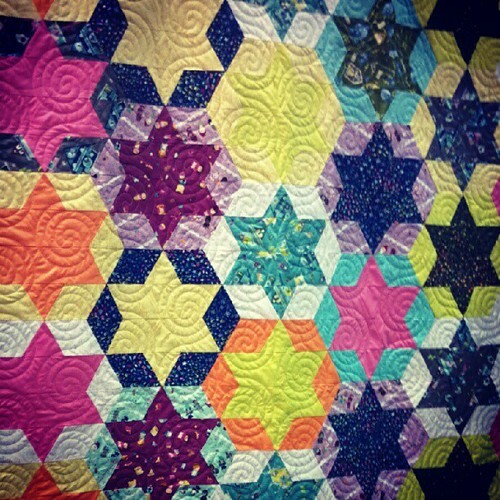 Great progress on the Hexies! I showed mine to Father he thought it was done by machine! 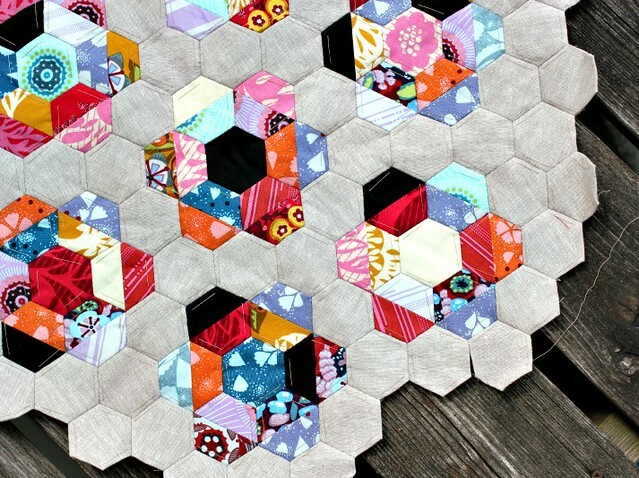 I <3 your hexagons! 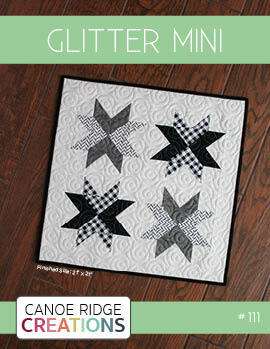 I've never done half hexies but I think I should give them a go! 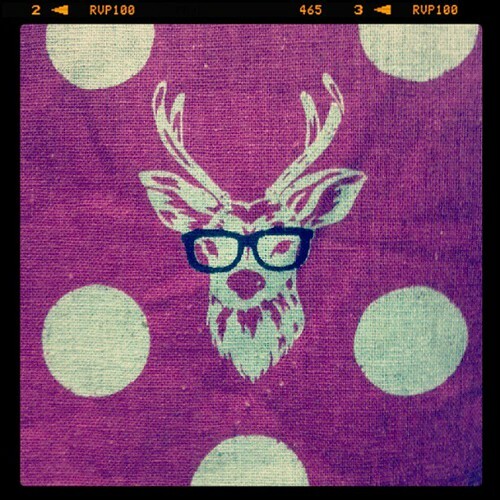 That hipster deer is so awesome, I'd bet he's wearing a cardigan too! 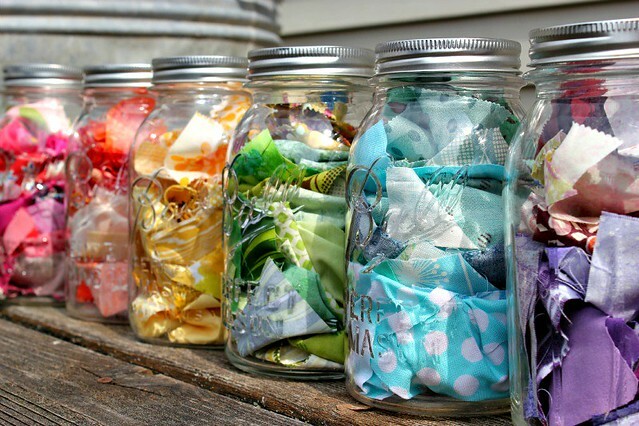 I lik the idea of sorting the scraps in the jars... its great to be able to see the colors!